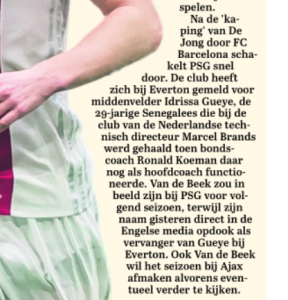 Dutch newspaper De Telegraaf have a snippet in their Thursday edition about supposed Everton interest in Donny van de Beek. 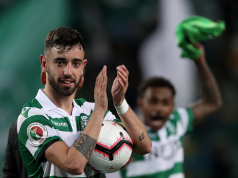 It’s claimed that the English media reported on Wednesday that Everton are keen on the Ajax midfielder as a potential replacement for Idrissa Gueye. Van de Beek is also said to be interesting PSG, who in turn also want Gueye, but the Dutchman isn’t thought to be one of their core targets. De Telegraaf send a message to Marcel Brands and the Toffees, along with PSG, that Van de Beek doesn’t want to leave the Eredivisie club this month, and would therefore look at his situation in the summer rather than now. However, these British reports are hard to find, we’ve already done a search and come up with nothing. Should they not exist, then it’s quite curious that De Telegraaf would be covering it today, at the same time as talking down the prospect. Perhaps it’s a little Ajax transfer public relations.